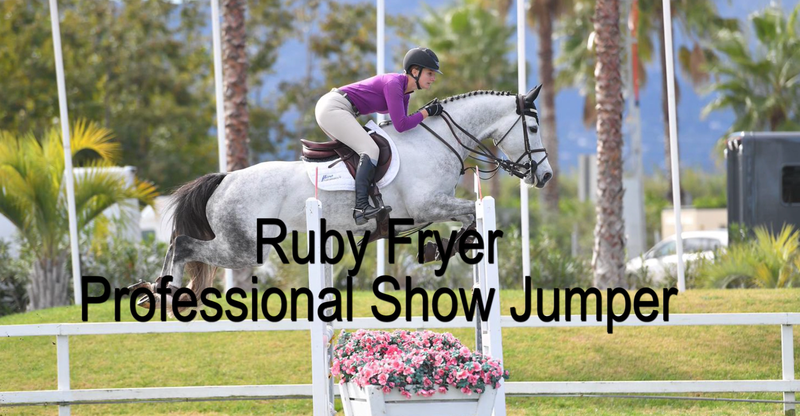 We managed to catch up with MicroPerformance+ advocate Ruby Fryer at the end of a fruitful season and after her recent success at the Mediterranean Equestrian Tour (MET) in Oliva Nova. Ruby tells us about her past experiences, especially the influence and advice of her mentor and equestrian legend, the late Tim Stockdale. Furthermore, she discusses her plans for next year with her favourite MP+ products by her side. So, who is Ruby Fryer? Hi, I am Ruby Fryer. 21 years old, based in Kent. Previously worked for Tim Stockdale which was amazing. What do you enjoy most about Show Jumping? Everything, I think! I love the competitiveness. I always want to do well. Something I always want to do when I go into the ring especially when I work with young horses, I love seeing them improve. I was lucky enough to win the 6 year old finals at “Oliva Nova” (MET) with my amazing “Hallmark”. What is the biggest challenge in the sport? There are so many challenges. With horses the highs are amazing and the lows can be heartbreaking! To be positive, to stick at it! When I worked for Tim Stockdale one thing that always stuck on my mind was to be positive and mean it! Everyone makes mistakes but just try. If you get it wrong that’s fine, next time you learn from it, but you’ve got to give it your all. Why do you love MicroPerformance+? I absolutely adore MicroPerformance products because they are practical. So many things these days are just a gimmick but everything about MicroPerformance actually works. There is a reason behind it. Their Numnahs are fantastic. The products they use, the materials are cutting edge and I wouldn’t be without them. Which product can you not live without? I have to say I love my MicroPerformance gloves. They are ever so warm, practical, grip is amazing and obviously with modern day technology we can’t live without our phones. Luckily I can use my phone with the gloves on! Next year I would really like to chase all the Age Finals again with my young horses, all stepping up. I would love to try and qualify for Newcomers and Foxhunter Masters with my 6 and 7 year olds. We take this opportunity to wish Ruby the best of luck for next year. Black Friday on the horizon – Discount!